Story of an ambitious young doctor through unethical means intend to make a quick career. Now is primary in a luxury clinic where administers the sick with the same cynicism of his young years. From the Producer of "The Garden of the Finzi-Continis" and the Director of "The Four Days of Naples" A New Dimension in Suspense! I saw this excellent film a long time ago, but it's still vivid in my mind. The plot is very simple. 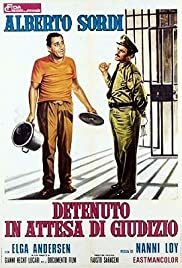 Sordi gets busted for something he didn't do. A series of coincidences and unfortunate events pushes him further and further into the murky depths of the state penal system. As the film progresses, dark comedy is getting darker by the minute, as our hero gets stripped of even the basic human dignity. The scary bureaucracy and gritty prison sequences retain just enough realism not to slip into a morbid fairy-tale. If the story was not set in post-war Italy but in a dictatorship, it would come out as perfectly realistic. Sordi, one of the best Italian actors of all time, is perfect as the naive good guy in an extreme predicament. This is paranoid entertainment at its best.